I have been so sad to watch on Facebook and Twitter the stories about people who have lost their dogs during fireworks over the last week. I even saw one of my mom’s neighbors, the best Good Samaritan I have ever seen, guarding a dog until animal control could pick her up. She clearly had gotten loose during the noise, and she was still terrified. I’ve seen even more posts from people who haven’t lost their dogs, but have dealt with their terror night after night. I am so lucky. Murphy is not afraid of fireworks. If it gets really loud, he will look at me for reassurance and then calm right back down. Now, I don’t live in an area where the neighbors shoot off fireworks close to my house. And we tend to go to the mountains for the July 4th holiday. There are big fireworks shows, but neighbors aren’t going crazy with the loud stuff. That helps a lot. Thunderstorms don’t bother him either. The first storm that we had after I adopted him; I rushed home from work because I was sure he would be panicked. This was during his early, scared of everything time. He seemed perplexed that I was there and was as calm as he could be. He isn’t crazy about driving in the mountains. In fact, a couple of times he panicked. I tried distracting him with treats unsuccessfully. I now carry an essential oil blend to calm dogs and use an air vent diffuser for it. It seems to help. For the second year we went to the Banner Elk, NC July 4th parade. It is one of those parades where anyone can be in. And it is so much fun. We had a great time. Murphy just wishes they threw dog treats rather than candy! Murphy is very focused on the parade! I'm sure he thought this was a good look! 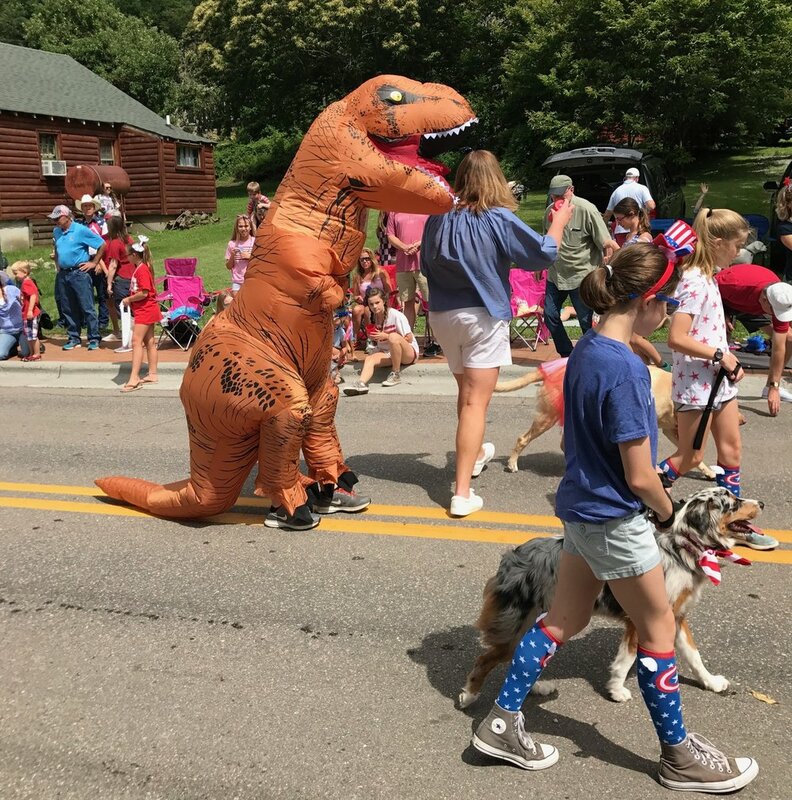 I'm thinking TRex was a little before 1776, but my history was never that good.